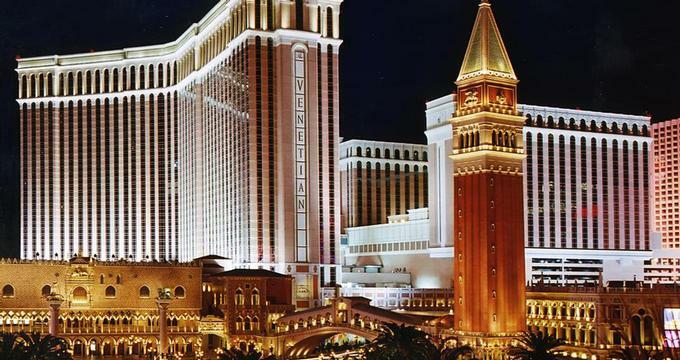 The Venetian in Las Vegas is a vacation destination in itself. The 1.5 Billion Resort is an artful replica of the city of Venice in Italy and its famous attractions, including St Mark's Square, Campanile Tower, Dodge's Palace, Rialto Bridge and the Grand Canal. The hotel is perfect for honeymooners. The Canyon Ranch SpaClub is modeled after the famous Canyon Ranch health resort. The resort has a five-acre pool deck with three pools and two spas where guests can relax and order a cocktail from the elegant poolside Solaro Cafe. Private cabanas are available for rent on the pool deck. Shops along the Grand Canal sell casual and designer clothing, jewelery and gifts. Brand names include Burberry, Kenneth Cole, Ann Taylor, Banana Republic, Sephora, and many others. The hotel is home to two museums: Guggenheim featuring The Art of the Motorcycle installation and Guggenheim Hermitage featuring Masterpieces and Master Collectors. The 120,000 square foot gaming floor includes 2,200 slot machines, 120 table games, and a race and sports book. The casino has a separate high-limit salon in a semi-private gaming area offering baccarat and 12 high-limit table games. The most luxurious area on the gaming floor is the private Gold Club Lounge. Venus is a glamorous and seductive club featuring the tiki bar that serves exotic drinks and the main lounge offering table seating and bottle service. The waitresses at Venus are all dressed in elegant red dresses. Reservations are recommended. V Bar, created by the owners of New York City's club Lotus, is an upscale lounge featuring opaque glass walls, leather chaise lounges and subdued lighting. La Scena Lounge offers nightly live entertainment and a variety of musical styles. Guests can dance or entertain themselves with video games. The hotel offers elegant Venetian-style luxury suites, measuring at least 650 square feet. The Standard Luxury Suites have a king size bed, a sunken living room, and a large bathroom finished in fine Italian marble. The Piazza Suites offer a double door entrance, an all Italian marble entranceway, a living room with a 36" television, a formal dining area and complete wet bar. The Piazza Suites measure up to 1,456 square feet. There are seventeen different restaurants, including Emeril Lagasse's Delmonico Steakhouse featuring New Orleans-style cuisine, and Wolfgang Puck's Postrio serving contemporary American cuisine. Other restaurants at the resort serve French, Italian, Venetian, French/Californian, Pan-Asian, and Mexican cuisine. The Grand Canal Shoppes feature luxury shopping, street performers and romantic ambiance. The indoor shops are located along a street with a blue ceiling and a lagoon with gondolas. Choose from an array of products, ranging from clothing to jewelery and home decor. There are several cafes and restaurants at the mall where you can rest your feet. The shopping mall is open Sunday - Thursday from 10am to 11pm; and Friday - Saturday from 10am to midnight. For more information, call 702-414-4500. Nearby attractions include the Lake of Dreams, the Sirens of TI and the Mirage volcano. Rates vary by season and occupancy. If the hotel is hosting a convention when you are planning your visit you can expect to pay more. The hotel offers a number of packages and frequently lists special offers on their web site.